Bring Android for Work, to work, with MobileIron and enable a suite of PIM apps in a secure, separately managed OS-level container. Android for Work is a new enterprise program designed to increase Android adoption by enabling consistent IT management and secure app distribution through an ecosystem of EMM providers. With Android for Work, IT gets a unified way to secure enterprise apps, manage disparate devices, and separate work and personal data at the OS level. 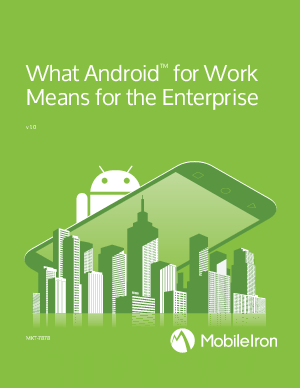 To help IT Administrators understand how Android for Work will impact their organization, this white paper provides an overview of the new capabilities and recommendations for deploying and managing Android devices in the Enterprise.